The Music Initiative works with a global partnership network of arts presenters, cultural organisations, and academic institutions to curate concerts, festivals, artist-in-residence programmes, and workshops featuring musicians in the Music Initiative’s artist roster (see list on website) and new work developed by them. These performance events present artists who have distinguished themselves as musical innovators, whether working within the framework of traditional repertoires and styles, contemporized expressions of traditional material, or intercultural collaboration. 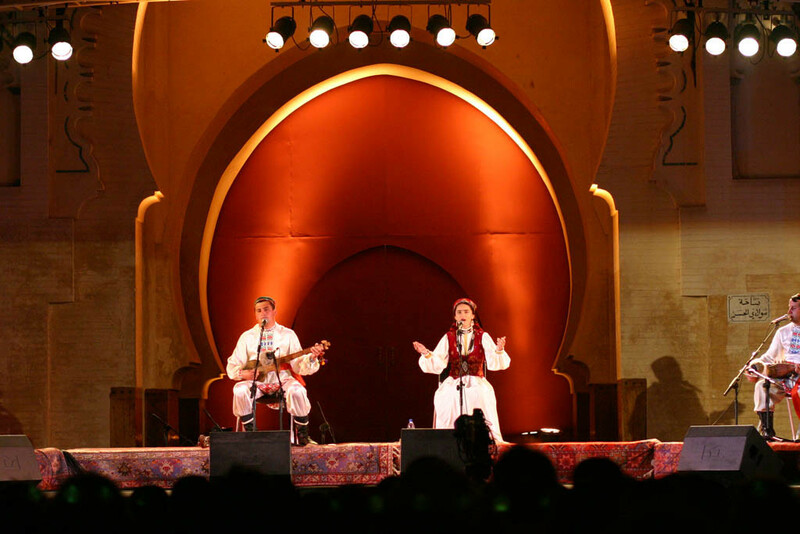 Badakhshan Ensemble at Bab Madina, Fez Festival of World Sacred Music, Morocco. Performance venues are selected with the aim of reaching audiences of diverse profiles and age groups, and presentation formats are designed to contextualize performers and their music within a broad cultural frame. Short documentary films screened at the start of a concert introduce audiences to the featured musicians, and to the communities in which they live and work. Supertitles with translations of song lyrics, live video feeds displaying close-up images of musicians and their instruments, and video scenography projected on large panels at the rear of the stage are among the visual aids that have enhanced performances curated and co-produced by the Music Initiative. Concert programmes continually change, and may include traditional musical styles, genres, and repertoires as well as newly created and arranged works that draw inspiration from tradition but are expressed in contemporary musical languages. As the Music Initiative’s artist roster broadens to include artists from Mali, Egypt, Tunisia, Syria, Iran and the subcontinent alongside an older cohort from Central Eurasia, interregional artistic collaborations have come to play an increasingly important role in international performance and outreach. The Music Initiative has curated and presented performances in prestigious concert and festival venues in Europe, the United States, and North Africa, including the Asia Society, Barbican Centre, Carnegie Hall, Cité de la Musique, Edinburgh Festival, English National Opera, Fez Festival of Sacred Music, Freer and Sackler Galleries of the Smithsonian Institution, Metropolitan Museum of Art, Théâtre de la Ville, and others. Multi-year co-presenting agreements with Asia Society, Edinburgh Festival, and Théâtre de la Ville facilitate long-term artistic planning for the commissioning and presentation of new work and new creative collaborations. Artist-in-Residence and workshop programmes link the Music Initiative’s educational mission to its curatorial expertise. Frequently organised in conjunction with a formal concert, workshops and residencies invite college and university students to interact directly with musicians from the Music Initiative’s artist roster in intimate classroom settings and hands-on creative workshops. Facilitated by teacher-curators who serve as intermediaries between musicians and students, residency programmes offer an exceptional opportunity to explore fundamental questions about musical creativity within culture-specific artistic languages and forms as well as across cultures. Workshops and residencies simultaneously strengthen students’ understanding of music and poetry from the Muslim world and offer a strong creative stimulus to the musicians who present them, frequently leading to ideas for new forms of presentation, and new work. Residencies and workshops supported by the Music Initiative have been presented at leading colleges and universities in Europe and North America, including the School of Oriental and African Studies, Brandeis, Columbia, Harvard, Stanford, and Wesleyan Universities, and Dartmouth College, among others.